In the summer of the early 1990s, I was a student at Presidency College, Kolkata, then Calcutta. I would ride a bus for an hour to reach this college, weighed down by heritage. My friends and I reinstated the film club when we were there, and named it Chalachitra Samad. We watched films, debated fiercely and fearlessly, like we had nothing to lose, and we really didn’t. It was during my time at the film club that I first wrote about cinema, a Bengali article titled “Keno Bergman? Keno Noy?” [Why Bergman? Why not?]. I could access only a few pamphlets from senior students, and one Bengali book on Bergman that was available at the time. I don’t remember what I wrote, but Bergman has never left me since. For the boldness in his quest for truth, and the perennial self exploration. We emerged as burly men from feeble boys, in our dreams, and also in the collective subconscious of Bergman, Tarkovsky and a handful others. By then we had grown to know that faith indeed is loving someone who is out there in the darkness but never appears, however loudly you call. In July this year, I showed Wild Strawberries to my students, all in their early teens, and I asked what they would like to change in the film. They unequivocally decided they wanted to change the open ending of the film. When I first watched Wild Strawberries a quarter of a century ago, I was just slightly older than them. I still believed the world had losers who could fight it out with Death. I cheered the open endings of these alluring fables, I embraced them. Bergman was alive and seventy-five then. Now, a century after his birth, he is gone, dead and closed. But, not yet, probably. The visceral beauty of his works, the inner radiance of his characters, the veracity of his magnificent actors, the blackness of his white screen lighting up a rainbow shawl—these reaffirm life more than death. And the portraits in Bergman’s films that speak of ancient allegories, that even when still, stir up emotions, the dance of death sublimely giving way to the birth of beliefs. In 2000, a film magazine was born: Silhouette. The founding members eventually splintered, but we have been regrouping since January this year, to watch many beloved films. We had initially bonded over Bergman and Ozu, de Sica and Angelopoulos; these masters brought us together. 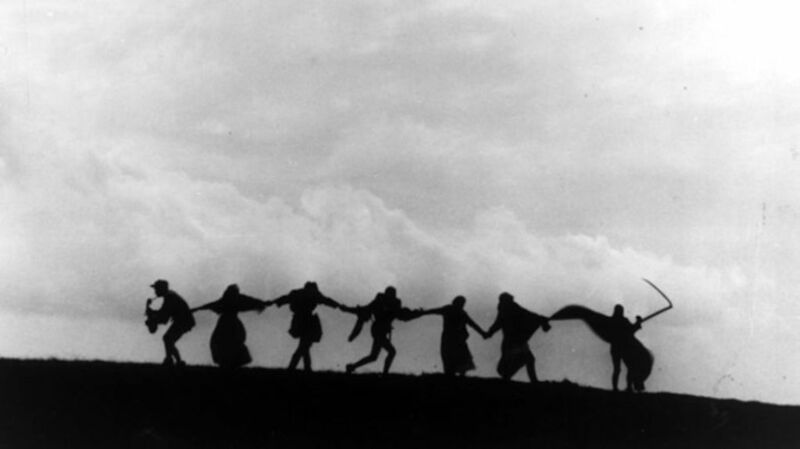 On the occasion of his birth centenary, I watched another Bergman film with this group of cinephiles— his last, Saraband. I had watched Saraband by myself multiple times in these years, to touch Liv Ullmann and Erland Josephson, to touch Bergman and to touch my own battered soul lying in rest. After we watched Saraband together, we found that we could not speak for a while. This film takes me to many places, some too painful to revisit. It takes me to the Intensive Care Unit, at a time when my mother was fragile, broken from inside, her will to live diminishing with every extraction of arterial blood. I would sit outside the ICU, along with other patient parties, as we were referred to in hospital parlance. We were waiting for nothing, friends and family waited with us. My mother, a university topper at the Master’s level, a professor of Economics, a teacher for thirty seven years, a doctoral candidate much later in life—she never complained, never regretted that her domestic life forced a sabbatical on her studies. She never took pride in her thesis either. She kept working. And now she was slipping away. We became accustomed to her multiple ailments, her daily decay, guilty of our complacency that we believed brought her here. She tried to hold my hands once. The cold numbness of hospitals froze me, as I managed a whisper, “You will be better soon, ma”. “Na, chai na, I don’t want to”, she whimpered, her last words to me, her lonely son. I didn’t cry much, just a temporary breakdown to my eldest cousin brother, her favourite nephew and a doctor in the same hospital. I couldn’t afford to grieve for too long, there were too many things that needed to be done—more things now than when she was alive. I never cried after as well. I tried to replay the memory machine in my head, and the only visuals I could find were that of an ailing woman. How do I reconcile with a failed recollection? Yet, at times, when the signal on the Eastern Metropolitan bypass in Kolkata would turn green from red, there was a sweep of nostalgia, a whiff of a past life, lived yet forgotten. Like the fleeting brushstroke of an artist, she would appear and vanish, weaving stories, fading in and out like on celluloid. I was surprised when so many of my Bengali poems turned out to be odes to her. Tender, written in solitude, like secret adventures in a forlorn canopy. But I still wasn’t grieving. Then there was Saraband. To me it was like a world coming to an end. At his sublime best Bergman, carried with him a disturbed psyche on the brink of life, returning again and again, to taste sorrows. And then it came to me: I could relate to Julia Dufvenius, who played Karin in Saraband. She was the restless soul torn between memories and the present, between innocence and fragility, she was the link between life and death. Karin is me. I had been unkind to myself, unjust to my aspirations, harsh to my mother. I was probably not a worthy son, the weight of my guilt buried me. Maybe, I thought, if we meet on the other side, I could confess my shortcomings to her. I could confess the yearnings of a failed inheritance. In the five years since my mother passed away, I cried in public for the first time. Not in my poems or in silent deaths within my sleep. But in the arms of my friends—a home called Silhouette. Amitava Nag is an independent film critic based in Kolkata. He is the editor of the film magazine Silhouette. His most recent book on cinema is Beyond Apu: 20 Favourite film roles of Soumitra Chatterjee, published by Harper Collins India. A book on Satyajit Ray’s heroes and heroines and a biography of Tapan Sinha are awaiting publication. He also writes poetry and short fiction in Bengali and English.